Home » 1400 Pedestal - Heating 2000 sq. ft.
1400 Pedestal - Heating 2000 sq. ft. The 1400 wood stove is shown in porcelain almond enamel with its flamboyant 24 Karat gold arched door. 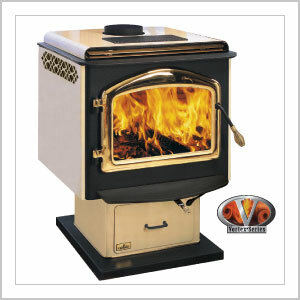 The 1400 wood stove's upper firebox is lined with heat resistant ceramic fiber baffles.